I know that this probably isnt the forum for reef tank questions. But I am having a hard time looking for lighting for a 20 gallon reef tank that I am making I am trying to stay under $80 for the lighting I'll be using only soft corals. I am new to salt water so I am unsure. I have normal led strips that are white light but I might need something different. Any suggestions? One of the"black box" LED's would do..
bit over budget but............there are dozens of "like" units w/ slightly different prices..
for some reason the Mars Aqua is rated slightly higher than most of the others..
Not sure it's justified, it just "is"..
Sure.. but not the "usual" err color.. I never tried them so i cannot comment how they are. But more to "our" point.. Out of stock of the fw ones..
You should also consider a used AI Prime. What are the dimensions of your 20? Lighting is just about the most talked about area in the SW reef hobby. There are also a lot of opinions about what is the best way to go, especially if your on a budget. 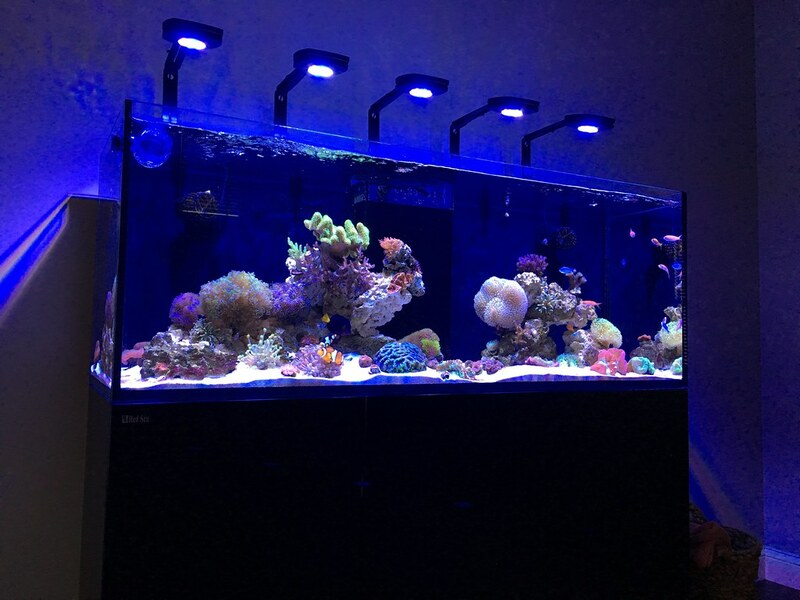 Since your keeping soft corals, you don't want to skimp too much on lighting. The various Black Box" units mentioned by @jeffkrol and others are reasonable choices, but there are a couple of downsides. The main one is that it is almost impossible to find replacement parts for them. In other words, if something fails in the fixture, it's done, and you'll often need to replace it. A fixture like the high end lighting like an AI Prime often hace replacement parts available through the vendor. Even so they are proprietary parts and not off the shelf, and they can be fairly expensive. The other advantage with high end lighting is how much more you can control it. It's usually got more adjustable channels, and there is usually a smart phone app so you can set the lighting up anywhere. Naturally all this stuff make such fixtures cost more. Now contrast this with T5 lighting. These are usually not as expensive to purchase but the bulb replacement and power consumption will cost you more long term. However, it's got a big advantage. Parts that need replacement like ballasts are off the shelf products, and easily available. The bottom line here is that there is not necessarily one perfect solution for you. You will need to consider the cost to purchase the fixture, the cost to run the fixture, availability or parts, and how versatile the fixture is. All of the above choices will work for you. It's just what fits your needs and budget best. If I were choosing for myself, I think I'd opt for getting something like the AI Prime. Yes I know that's about 2 1/2 times the budget you would like, but I feel the parts availability and control features make it worth the price. Others will not agree. My second choice would be for the Black Box lighting, and that's much closer to your budget, and a reasonable choice. That's perfect for a used Prime! Like I said earlier and DaveK also noted, you won't be disappointed with a Prime. I run one over my daughter's vivarium for her crested gecko. I also used to run 5 of them over my reef tank a few years ago... zero issues with them!